My heartfelt thanks Microsoft. Once again and for the past 7 years, I am tremendously honoured to receive the distinguished Microsoft MVP award, particularly given the select group of experts who are recognized. 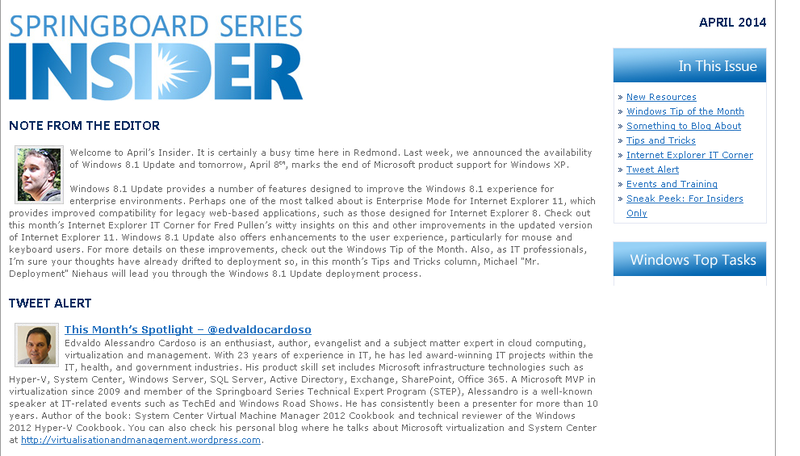 A big thank you to Ben Armstrong, Sarah Cooley and the Hyper-V team. “The Microsoft MVP Award recognizes inspiring, trusted, and independent experts from around the world who voluntarily share their passion and knowledge of Microsoft products with others. … MVPs represent nearly 100 countries, speak over 40 different languages, and are awarded in almost 90 Microsoft technologies. Together, they answer more than 10 million questions each year. I’m really looking forward to 2015 as it is promising to be a very exciting year with the release of Windows Server and System Center vNext looking to be one of the best versions ever launched. Once again, THANK YOU! It is great to be awarded for something you love to do and it is a great motivation to continue contributing to the community. Recently Microsoft released the preview version of their next release of Windows Server, Hyper-V and System Center as did Savision with Live Maps for System Center. You can download System Center vNext Preview here and Savision Live Maps from here. You installed the SQL Server 2014 as the database server for the System Center vNext preview edition. To note, I run into SQL connectivity issues when I tried to use an SQL 2012 version, with a message stating that I did not have a compatible version of SQL installed. Whereas the documentation says that SQL 2012 is supported for vNext preview it is not the case. You installed Reporting Services (SSRS), Analysis Services and Full Text Search as it is required by Operations Manager. You created an account to install System Center and it is member of local administrators. For this post, I created an account named “sc-admin”. The “sc-admin” account has permissions to create a database in the installed SQL server. You can achieve this by either adding the account to the SQL server administrators when install SQL Server, of by adding the account using SQL Server Management Studio, by expanding Security->Logins and then creating a new login, adding the “sc-admin” account and selecting “sysadmin” as permission under Server Roles (preferable). You can also, if security is a concern, create a OperationsManager database and give the account DB Owner (dbo) permission. Or else the following error will appear when the Reporting Services configuration times come in the Operations Manager installation wizard. I also recommend selecting the Download the latest updates to the setup program checkbox. Select the System Center features you want to install. For this post, I am selecting: Management Server, Operations Console and Reporting Server. Click Next to continue. In the Select Installation location, provide the path for Operations Manager installation and click on Next. Your system will now be checked for hardware and software against System Center requirements. If some requirements are missing it will appear on the screen for your resolution. Note that in the above example there are two warnings: the first one about the system not having the recommended 4GB of memory and the second one about a pending restart. As I am installing this for a demo purpose, I can safely ignore the 1st warning, but I will have to click on Cancel and restart the machine in order to proceed the installation. If no error is reported, click on Next to continue. In the Specify the installation option, select Create the first Management server in a new management group and provide the name. For this post I am using the name “lab” for the management group name. Click on Next to continue and accept the License terms and click on Next to proceed. Click on Next to continue and in the next step confirm the SQL Server instance that is running the SQL Reporting Services and then click on Next to proceed. In the Configure Operations Manager accounts, provide the accounts details and click on Next to proceed. In the Help improve Operations manager, select the desired options and click on Next to proceed. In the Update screen select the desired option (On is recommended) and click on Next to proceed. On the Installation Summary, click on Install and wait for the installation to complete. Now we have System Center Operations Manager successfully installed. This year I will be presenting 4 ILL sessions at TechEd Australia, but you can also find me at the Microsoft Showcase : Datacenter and at the Insight booth in the Exhibition Centre. Take time to visit Insight booth and learn about what we can do to help your business and to enter on a draw to win a Microsoft Surface or a signed copy of my book: System Center 2012 VMM. Whether you build apps or support the infrastructure that runs the apps, the cloud can be a really big place. For some, it’s a natural evolution for their application and infrastructure to embrace the power and scale of the cloud. For others, it’s a journey that has to begin with a single step. Windows Azure provides that first step with a scalable, flexible platform for deploying your applications your way. With our Infrastructure as a Service platform (IaaS) called Windows Azure Virtual Machines, you get the flexibility to choose between Windows and Linux with full control over the operating system configuration and installed software, matched with the portability of Hyper-V disk images. Windows Azure Virtual Machines provide the perfect environment for meeting all of your Infrastructure-as-a-Service needs. To learn more about our Infrastructure as a Service platform, we invite all developers and IT professionals to join Matt Hester as he introduces you to the Microsoft Cloud Platform, dives deep into Windows Azure Virtual Machines, and helps walk you through a hands-on demonstration of the power of IaaS on the Windows Azure platform. This is part 1 of 2. Please plan on attending both WAD-IL201 and WAD-IL202 to complete the lab. The lab requires you to connect to the Windows Azure Portal, where you will provision three separate virtual machines in the cloud and configure them each via a Remote Desktop client connection. All participants need to have access for Windows Azure prior to the lab. You can register for a FREE 90-day trial of the Windows Azure prior to the lab. You can sign up for your FREE trial here: http://aka.ms/IaasBootCamp. This is part 2 of 2. In order to attend this session you need to attend WAD-IL201 first. This lab guides you through several process automation examples, providing hands-on experience with the concepts explained in the course manual and provides real-world context. In this exercise, you are introduced to the interfaces available with Orchestrator. Create a Runbook to perform actions such as working with File Management Objects, monitor a folder for the accumulation of more than 5 log files, move the files to an archive folder and log an event for each file archive operation, using the Runbook Tester Console to Validate Runbooks. This lab also covers the creation of a Runbook to perform the actions, such as automate recovery of a Windows Service based on alert detection from a unit monitor in System Center Operations Manager to address the intermittent Windows service failures. It also highlights advanced concepts and techniques that can be employed when creating runbooks in Orchestrator. This lab provides a step-by-step description for how to build, configure and implement Hyper-V Network Virtualization using Windows Server 2012 and System Center 2012 SP1. You create a multi-tenant virtual network on shared physical network including multiple subnets and virtual routes using the NVGRE configuration. With Server 2012 and VMM 2012 SP1, Microsoft enabled new foundational scenarios from Continuous Availability (with in-box NIC Teaming) to building blocks for Software Defined Networking (with the extensible Hyper-V Virtual Switch and Hyper-V Network Virtualization [HNV]) to IP Address Management (IPAM). Now with Server and VMM 2012R2, Microsoft is targeting the reduction of networking Capital Expenditures (CapEx), by enabling customers to maximize utilization of their existing resources and reduce the need for specialized hardware over time. Microsoft got the feedback from customers advising that they want choice and flexibility in both the networking vendors they use and the cloud in which their workloads run. They need the ability to plug and play between vendors without having to change management software, processes, or knowledge, plus the ability to deploy any workloads across any cloud provider. The other feedback received by Microsoft is that network automation is key. Automation is required across the Service Provider’s network, the tenant’s network, and network infrastructure services (load balancing, firewall, etc. ).